it doesn't look good for Thursday night, which was our planned time to observe the minima of Algol. There are other alternative things to do and backup observing plans and another opportunity to observe the Algol minima and we will discuss these good things below. 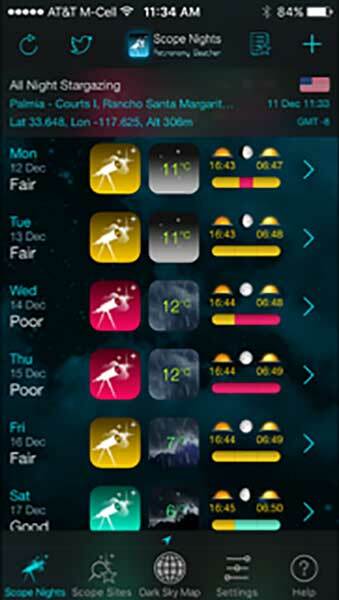 So, it looks like this is a good week to concentrate more on indoors activity. You might check out the free lecture on climate change at the Distinctive Voices lecture at the Beckman Center on Wednesday, December 14, or the free OCA Astrophysics lecture on Friday at the OC Heritage Museum. See you there! It turns out though that the good news for observing could be Saturday, December 17 at OCA Black Star canyon event. The forecast is for clear skies. Resident Astronomer Peggy will use her binoculars and I'll practice alignments. See you there! My tentative observing plan for Black Star is to practice some more careful polar alignment. I need better polar alignment, not just so the goto capability works better, and longer exposure photos turn out ok, but to better meet my long time goals of being able to track individual stars very accurately and keep the star image focused on the spectrometer slit. I want to finally mount the spectrometer and see if I can get some good stellar and galactic spectra. I have just been too afraid to go through all the extra effort of connecting the spectrometer, until I know that the mount alignment and tracking are right on. In fact, I might need to install the guiding camera as well and I just want to be sure that my tracking technique is better before tackling the spectrometer requirements also. I'll probably bring my better Celestron AVX mount and leave the light weight Ioptron mount at home, but just use my Tamron 600mm telephoto lens, in lieu of the bigger telescope. Again, this plan is all about ease of setting up and the wide field of view possible with the telephoto lens means that I can go after a wider range of targets. So, it will mostly be a night of practice for me. What will you be looking at? One of my targets for the evening will be capturing a photo image of R Leporis. What's that you say, you haven't heard of R Leporis? Well, I had not heard of it either, until OCA What's Up speaker, Jim Benet, told us all about it at the last OCA general meeting. Jim let us in that it is a distinctly red, variable, carbon star, with a period of around 430 days and magnitude going between 5.5 and 11.7 at its dimmest. It is also known as Hind's Crimson Star. Thanks for that high energy What's Up, Jim. So, regardless of where it is in its variable magnitude cycle, it is going to be quite dim and likely not visible to the naked eye. 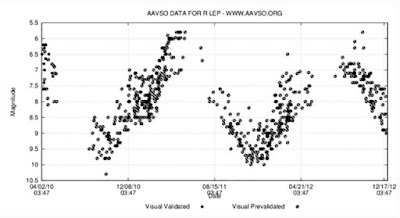 AAVSO members have been observing and measuring R Leporis for years now and the following chart shows some of the magnitude measurements that members have submitted. You can see that it spends a lot of time on the dim side of the light curve. I'll try finding it at (RA, Dec) = ( 04 59 36, -14 48 22), so look there if you want to take a look for it too! 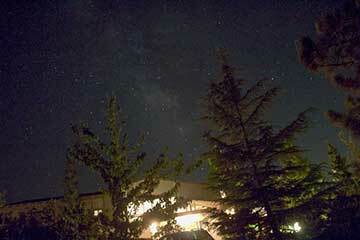 I hope to just take a photo of the red star and won't be doing any magnitude measurement. Now, it turns out the day after Black Star party, Sunday, might also be a very good observing opportunity for another Algol minia. In case the December 15 date with Algol is clouded out, the next available date for observing the Algol minimum is Sunday, December 18 at about 11:30pm. The orbital period for the binary star Algol is just 2.87 days, so we are lucky and have a second chance to capture the minimum then. 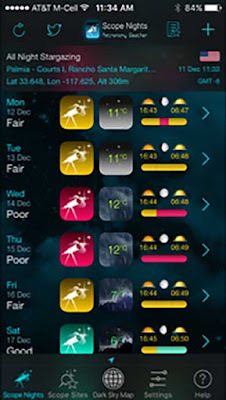 The 7 day forecast is for clear skies, so put the 18th on your calendar. I hope the weather is clear and I can stay awake long enough to capture 10-12 magnitude measurements over 3-4 hours of the minimum and be able to plot a neat eclipse light curve showing the dip from 2.1 to 3.3 and back to 2.1. Stay tuned! On a personal note, the Resident Astronomers of the observatory staff celebrated their 28th wedding anniversary at Keno's in Anaheim Hills. 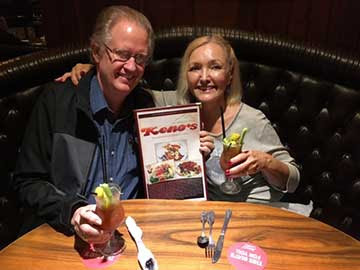 We have been going to Keno's for probably 30 years now, almost once a week, until we moved to south OC, and find they still have the best Bloody Mary's in OC. Anyway, it was great to get back up to Keno's and verify that the drinks and food were just as good usual. It has been a fun journey for the first 28 years, with hopefully more to come! Thank you Peggy.